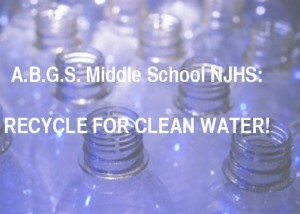 ABGS NJHS: Recycle for Clean Water! The National Junior Honor Society at the A.B.G.S. Middle School located in Hempstead, NY noticed there was a large amount of plastics and cans not recycled in the building. The NJHS has started an initiative in the school to collect, recycle and donate the deposit fees to waterproject.org. As a group we understand value and importance of clean water. We are working together to "Recycle for Clean Water" and to help spread awareness in our school and community. 06/01/15 NJHS 2014-2015 ABGS Middle School, Hempstead $68.00 NJHS collected $68.00. Everyday we are recycling at ABGS Middle School. We added another classroom, Mrs. Davis math class. 03/19/15 National Junior Honor Society- ABGS Middle School $68.00 We are adding more classroom to recycle cans and bottles. NJHS students are working hard. 12/30/14 ABGS NJHS students $67.40 2014-2015 NJHS students added a new collection site, the science room. Thanks. 10/28/14 ABGS Middle School staff and students $25.00 ABGS staff and students are back recycling bottles and cans in school. 07/15/14 Grace Dong Janeo $90.00 Ms. Laga class at the ABGS Middle school donated many bottles to the NJHS Project. Many Thanks to Ms. Laga class for reading and understanding the challenges faced by Salva in Long Walk to Water. 05/26/14 Grace Dong Janeo $46.00 ABGS students are recycling bottles and cans weekly. Great job NJHS and Teacher's For Tomorrow students. 04/16/14 NJHS Middle School students and staff $51.00 NJHS Students are increasing their collection throughout the day. Staff are helping out. Many thanks. 12/29/13 NJHS Middle $40.00 Recycleable cans and bottles from the staff and students. Thanks for your continue support. 05/28/13 ABGS NJHS $63.00 The National Junior Honor Society are busy recycling and collecting for Earth Day. 03/24/13 ABGS NJHS $33.01 From February 4, 2013- March 24, 2013, the A.B.G.S. NJHS has collected and recycled 660 bottles and cans. Thanks for all of your help! 02/04/13 Grace Janeo $93.05 This amount of $93.05 is the sum of the donations for the months of November and December of 2012 and for January 2013 from the A.B.G.S. Middle School Community.